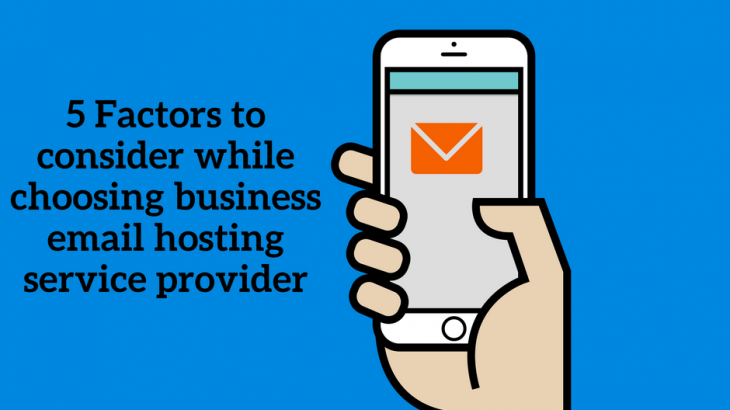 Choosing an email hosting service provider is vital to the business. Thus it is important to think and decide on the best one suitable for you. Out of a wide range of email services available on internet, how to choose the best one? This will help you to narrow down the choices to the best suited options for your business. Free or Paid Email Hosting? For small scale business setup especially cost-conscious business owners, free email service providers can be very powerful. But these are some vital inspections required for service provider, especially when free. Limited features might be exposed for use in the free version. At times, there’s a limit placed on number of emails via free versions. Data backup may not be present in the free version. Customer support facility may be limited and not available on emails and phone calls. The email hosting service must provide a good integration with the existing business software especially with the web site forms modules, marketing modules etc. Current relevant logs and system analytics may hold many relevant data onto how your business would plan to use emails or is already using, in case of migration. This data should be used in order to plan email requirements from business perspectives. Many non IT departments in the business like business clients, HR departments, and finance and Payroll departments will have their own set of email requirements. It will help to avoid various confusions later if at the planning phase itself these all departments are included to cite their email requirements. Many businesses use mobiles, tabs and other portable devices for work. The emails should be compliant in formats with these devices being used in the business. A compliance summary must be drawn as to what all is required for compatibility in your business. There are always hackers and criminals interested in your personal business data. Hence proprietary data and communication emails require high security as well as privacy measures. While choosing an email hosting provider, justified attention needs to be paid on security measures provided. Different malware and spam protection software are used by the providers. Level of safety and security provided by the email hosting providers must be studied and narrowed down to one best suitable for your business. Since when the service provider is in market? Service provider’s other customer reviews. How easy archiving and recovery mechanisms are built in the providers systems. Does it provide migration from existing platform being used by you? Find out the technical support provided by email hosting service provider. Even many big email hosting providers do not provide Support beyond L2. You just can directly raise a ticket but you cannot talk to them for resolution. Choosing an email hosting service provider is not as easy as it seems at the first look. All the above criteria need to be put to implementation before choosing THE RIGHT ONE which will assist you in your business and provide ROI from day 1. Logix Infosecurity being into this domain since last 17 years have found Organizations are facing this challenges while choosing their email hosting service provider.